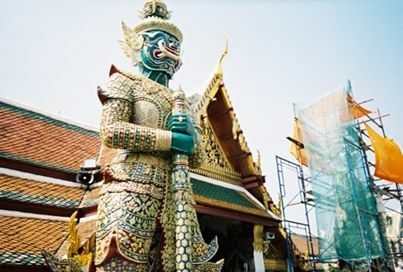 I visited Thailand when I was only 17 for the Boy Scout 20th World Jamboree. For those who don’t know, this is a gathering of scouts, (both boys and girls) from all over the world. So besides Thai culture, I got a small taste of cultures from everywhere. We spent the Jamboree camping near the beach on a naval base in Sattahip province. I didn’t get into the rural areas as much as I wanted but we spent plenty of time on the beach, a day hiking in the forest and a week touring Bangkok. I’m not usually in love with big cities but Bangkok is a fascinating place. It’s imbued with a sense of exotic history by its wealth of temples, including the temple of the golden Buddha, home of the world’s largest solid gold Buddha. There are also palaces both modern and in ruin, delicious spicy food, exotic wildlife and river boat tours of the city. Thailand is also a haven for wildlife, being home to more than 200 species of snake, perhaps more than 1000 bird species, and massive amounts of mammals, including sun bears, clouded leopards and elephants. Thailand also has beautiful beaches, rich rain forests and modest mountains. In short Thailand has something for everyone and I highly recommend it. Recently I read an article about a famed “tiger temple” in Thailand which was raided on suspicion of mistreatment of tigers kept by monks. You can read about the downside of the attraction here.